So stay tuned, I will update you after February 13th. In the meantime, please read highlights from 13D Research, a reputable think-tank. The title is, “Can America remain the world’s engine of innovation without manufacturing?” The analysis goes to the heart of what the President’s State of the Union should have addressed. Between 2001 and 2010, U.S. companies closed more than 42,000 factories, eliminating more than 5.5 million jobs. About a third of the country’s once-mighty manufacturing sector has disappeared. The loss of textile and toy production to low-cost producers has had devastating impact, but more painful still is the weakening of tomorrow’s manufacturing muscle—alternative-energy technologies, specialty chemicals, and electronics, among others. The number of high-tech manufacturing jobs in the United States has declined by 28% in the past decade, according to a recent report by the National Science Board. Most of these jobs have migrated to Asia—not because wages are so much lower, but because governments there are more accommodating. Turned off by a myriad of factors in the U.S.—high corporate taxes, low incentives, a lack of skilled workers, confusing paperwork and constant uncertainty about government policies—manufacturers are gravitating elsewhere. And once the manufacturing of a product moves abroad, the innovative energy around that product will soon follow. Caro Pope recently penned a three-part series for Bloomberg on the forces chipping away at Americas’ manufacturing edge. His conclusion—industries are leaving the U.S. not in search of cheaper workers, but of more supportive governments. Pope recounts an exchange with the head of Silicon Valley’s hottest clean-technology startups. In my opinion, the President’s State of the Union Address offered little investment value to the public. ¹ “What I Learned This Week.” 13D Research. January 26, 2012. St. Thomas, USVI. 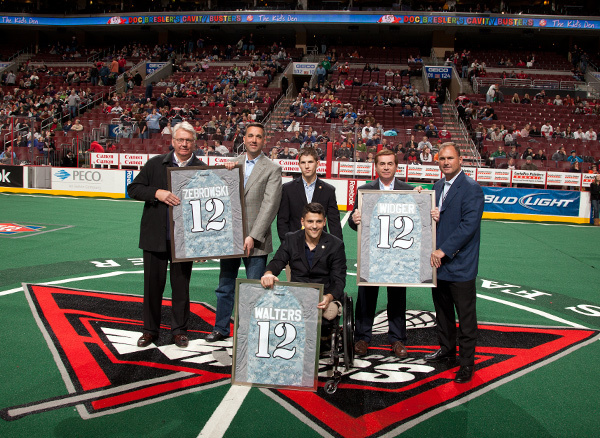 On Saturday, January 21, 2012, the Philadelphia Wings were hosts to the Washington Stealth in an American Heroes celebration of professional lacrosse. Brinker Capital and eMoney provided the Wings with commemorative camouflage jerseys that were auctioned after the game. Auction proceeds will benefit the Wounded Warriors Project, a non-profit organization that seeks to honor and empower injured veterans. A check will be presented to the Wounded Warriors project during the February 4, 2012 Wings game. Hope glided down Wall Street on the winter wind, filling the spaces begrudgingly vacated by uncertainty as positive economic data from both the European and North American continents combined with the increasing probability of more accommodative monetary policy being adopted in China to further displace the fear lingering in the marketplace and reaffirm optimism’s current position of prominence. Females working with female advisors appear to believe that their female advisor works more actively to build their financial knowledge. 63% of females with female advisors feel their advisor works with them to build knowledge. 47% of females with male advisors feel their advisor works with them to build knowledge. The most important step is to create a financial plan with your advisor that contains your specific goals. This should be reviewed annually to ensure accuracy. Have your family involved so they are familiar with your financial advisor, including having access to important documents. Finally, if you don’t understand something – ask questions. ¹ July 2010 Leveling the Playing Field: Upgrading the Wealth Management Experience for Women prepared by The Boston Consulting Group. ² March 2010 Women in America Report prepared by the U.S. Department of Commerce. ³ Brinker Capital Survey conducted in 2010 by an independent firm, Client Opinions. Base of respondents was 323 participants, 57% female, 43% male. 4 Statements and statistics mentioned in this section were generated based on the responses of the Brinker Capital Survey.